THE place to go shopping for discount name brand items long before it became fashionable for other businesses to do so. Became strictly a Building 19 in 2007. The following are links about Spags you may find interesting. Also check out the other pages. A new Spag's tribute site. The following are comments left about Spags from site visitors such as yourself. They are not spell checked or reviewed for accuracy. I remember my father taking me on shopping trips in late 50's and early 60's. It was great seeing all the stuff. Some of it hanging from the rafters as I recall. I only lived in Worcester for about a year (in the late 1990s) but Spag's left an indelible memory. My clearest memory is not of the store itself, though, but of the big sign with Mr. Spag's head: once, when driving past it one evening on the way to Uno's, the light caught it in such a way that the eyes/glasses glowed with an intense and frightening flash that would have made Stephen King proud. So glad I got to shop there! I grew up in Worcester in the 50's and 60's. A trip to Spag's with my Dad was a great adventure. It was the place where you could find everything. My father grew up with the guy who owned Spag's in Shrewsbury. The smell of rubber boots still takes me back there. "Spag's", the business, should be taken as an instruction pamphlet to all current business people. He was a man who saw a hole in the market and he filled it by providing all kinds of quality goods that people needed at rock-bottom prices ... and in the era when the only other option for consumers was department stores and cheap-o discounters like Zayre's. You would not find the latest fashion there (or fashion that had to be sold off at a discount because it had not sold ....) You would find "staples" .... work pants, shirts and boots ... paint for the house ... basic tools ... stuff you need every day, but of good quality at a good price ... Don't be hard on his kids. Times changed and they were wise to bail out when they saw the tsunami of mass-discounters like Marshall's and Home Goods and their ilk about to wipe out Spag's ability to compete ... and all that their father had worked so hard to leave them about to evaporate. Times do change. I, too, will always miss "Mr. Spags" dedication to make Christmas special and accessible to all families. (Even in the era of the discounters, he cut and kept his profits low to provide games and toys and decorations for the holidays at low cost to all families who shopped his store.) I really hope America will support small businesses because of the choices entrepreneurs (like him) choose to make to support their customers. A lot of American entrepreneurs could make higher profits if they sold lesser quality products or f they wanted to keep the money for themselves rather than trying to give their customers a great product. Remember him, "Mr. Spag's", and your local small businesses, when you shop Walmart's and the like during the year. If you want and like choice, support those businesses who give you choice. I read all the comments on the "Gone but not forgotten" site. I stumbled across this while looking for something else and got interested after reading a few comments. I never shopped at Spag's or even came close.I grew up in Missouri but after reading all those wonderful stories, I feel cheated that I didn't get to meet this marvelous man or get to shop in his store. What a kind and loving person he must have been to have touched so many lives and left so many warm memories. God bless you Mr. Borgottie. Spag's 1950's era "The real discount store" for Worcester area. Store had it all, things for guys like fishing, hunting etc. But it also had tons of household items for the ladies. Spag's trick was to buy from stores going out of business at below wholesale and then pass on the savings. Spag used his fleet ol old trailers as a moving device and as a warehouse. Nice way to save money and pass it along to us as a lower price. Bottom line love the store, a fun place to shop, don't fotget "no bags at Spag's". Spags was a household name when I was growing up. Anytime anyone mentioned they needed to go to Spags the car would usually fill up. Everyone wanted to go. I remember doing Christmas shopping there for the whole family. Hey, why go anywhere else - He had it all. When I got married, my now Ex-Husband's mother worked there. I think she worked for G.E. selling vac's. They leased space from Mr. Spag. It was just natural that I would continue to shop there as my Ex. loved the place too. After we purchased what we needed, there was an ice cream stand next to it and we would always stop and get ice cream. I will never forget the time we went and I asked the guy behind the counter if they had bugs. He was so insulted until I explained to him that that's what we called sprinkles or jimmies that you put on top of ice cream. Never used that expression again - especially around food!! Does anyone remember that place. I'm 61 so I'm sure it's no longer there. Some of my best memories were of shopping at Spag's with my grandfather. I was only about three or four, and remember holding on to his back pockets so we wouldn't get seperated in the store. I never could see much more than boxes,Aisles and aisles of boxes that held everything he needed. My grandmother would always remind hom on our way out the door "Don't spend all your money at Spag's!" My grandfather went to school with Mr. Spag, and worked for him for a short time as well. That Christmas, Mr. Spag brought Christmas to their famly, food for dinner, and gifts for the kids. He was a very kind and generous man. I am a child of the 70's lived with my mother & grandparents up on Grafton Hill. I will never forget hearing about how my grandfather (Papa), who never had a driver's license, used to take the bus and walk everywhere he wanted to go, one day went to Spags, as he so often did. He bought some tools and stuff (you know how Spags was when I say stuff) only to find after he returned home he realized they did not charge him for a few items as they should have. Well, being the honest & great man my grandfather was, he set off, walked to the bus stop, got on the bus again and headed back to Spags to make it right. Once there he met with Anthony "Spag" Borgatti who handed Papa a few empty boxes. It was then Mr.'Spag' proceeds to fill them with every imaginable tool and whatnot. My grandfather informed him that he could not accept all this stuff as he takes the bus. I was never told what all happened at that point but knowing my tough as nails, hard working Papa, he probably carried it all home on his back. I will always remember and love you, Pop ! "no bags at Spags" Loved that place! This old Marine takes his cover off in salute to Tim Pellegino's Papa. Salute! We moved from Seattle area to Harrisville NH in 1977. We live on a really tight budget and found out about SPAGS from new friends and neighbors. We were told we would find everything we needed at the SPAGS in Worcester. We found hot water bath enamel canners that held 7 2quart mason jars. We purchased 2 just for our family. I couldn't believe the variety of goods that could be obtained, the narrow aisles, shelves that reached to the ceiling. We're back in the northwest, but the visit to SPAGS was one of the highlights of our 5 1/2 years in New England. Right up there with our visits to Sturbridge Village, Boston, Salem, Acadia National Park, Mt Washington, Montreal, etc. When I was in fourth grade I stumbled upon Spag's while watching PBS and thought it said Spag's was a BBQ & Grill Restaurant. I couldn't remember whether the ad said Spug's, Spad's, Spig's, Spid's, Spad's, or Spag's. So I told my mom I wanted to go out to dinner at Spag's and she replied, "That's not a restaurant. That's a store." So I liked to imagine it was a restaurant until it shut down. My sister was U Mass Hospital for a Year back in 1977-1978 after a terrible accident to her leg and my mom used to me there everyweek. She would go every other day to see my sister there and I would go at least 2 times a week to see her. We would go to "SPAGS" and get her things for her Hospital stay. Things from Crafts to do, Comfy PJ"S, books and snacks for her and her nurses. I always snuck in a surprise for me too! Great toys and games there! My Mom would get cool household items to bring back home and christmas shopping there was a blast! The only bright side to seeing my sister in the hospital was the weekly visit to Spags! Thank you To MR. SPAGS! for all the great stuff that really cheered my sister up and helped my family up through such and ordeal. Normal, ordinary things were obtainable thanks to this great place! My brother used to run a disabled kids home in Worcster. On day he woke to find that someone had stolen the Santa form in front of Spags, and placed in on the back porch of the kids home. My brother called Spag, and Spag said "Thank you Tom, is there anything you need over there?" My brother didnt want to ask for anything, but says "Well, we can use a vcr." "You got it Tom" A few days later a vcr showed up. Two days before x-mas a large box of toys and candy "showed up" on the back porch. Knowing it was Spag, my brother called to thank him. "Oh, no Tom, you are the one who deserves thanks for what you do for those kids." Every year until he died, "Santa" left a box of toys and candy on the back porch of the kids home. I lived in Shrewsbury from 68-75. Those were great years to be a kid. Saturday night the whole family would get in the car to shop at Spags and the to Bradlees at White City. I remember the back parking lot had a popcorn cart as well as a slush cart which were mesmerizing as a little kid. On the other side was the ice cream stand where we'd be treated if we were really good. Going there was like going to a carnival. You'd see half the town there doing their shopping on the weekends. All the paint cans had the price written on the top in black marker and you had had to walk up and down ramps to go from the front to the rear of the store. Just about any visit you'd see Spag himself walking the floor and we'd approach him to say hi like he was a movie star. He'd always give you one of those nice greetings like "How you doing young fella?" Back then the cash registers were up front and you left through the front of the building. This allowed for the requisite 5 minutes of staring at the winking Spag sign out on the front sidewalk. Spags daughter was my first grade teacher at the Patton school which was equally cool. Wish I could go back to those days. I loved that store because you could find anything you were looking for there.And everytime i went there i would meet someone i knew.I was sad to here it turned into building 19. Anthony "Spag" Borgatti was a great man! I hope all that have a chance to read his book will do so. Anthony A. (Spag) Borgatti Jr. of Shrewsbury, the man who started one of the first discount stores in Massachusetts. Mr. Borgatti, who was born in Worcester, started Spag's Supply Inc. in 1934 with a $35 loan from his mother after graduating from Shrewsbury High School. Over the years it grew into a $90 million-a-year, 500-employee business. I remember meeting Mr. Spags. What a dump, the place was always overflowing with stuff, but Don't you just love a bargin. Never left the place without spending 40 or 50 bucks. Miss these kind of good old stores. As a kid in the 60's I remember my parents going to Spags every spring to get tomato plants. I'd check out the huge box of baseball gloves. Checking out I was mesmerized by the vacuum tubes the checkout clerks would put the money from the registers in. I loved watching the money get sucked around the tubes. ...great memories of a business trip to Mass 25yrs ago and on the way home, the maintenance guys told us we just HAD to stop at Spags. I ended up with a pair of shoes that became a favorite for many years. I'm finally back in the neighborhood again and dissapointed with the google results telling me that Spags is no longer. I'll have to check if Stew Leonard's still exists in Danbury! 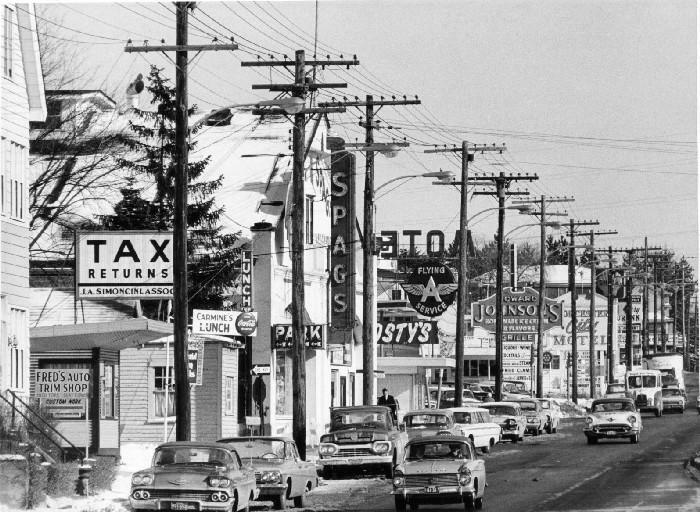 My dad worked at Spats..John Laskowski...he loved it...does anyone remember my dad? I actually have found the original truck that was the old man that parked in front of Spags for many, many years, selling popcorn, snow cones, and other treats. It was a red pickup with yellow lettering on it. The family still keeps the truck, and yes it is in Worcester, but they no longer use the truck for commercial purposes since their Grandfather who did the business used it. I just recently mentioned SPAGS to someone. That was the greatest place to shop! SO MUCH FUN! You got "NO BAGS AT SPAGS!" They had everything you could think of in the junkiest store ever! Too bad. The end of an era. It's really a shame that all these stores in Worcester are gone such as Nissen's Bread, Building #19, Spag's when I raised my 4 sons and 3 nephews, and foster children they always had good meals and snacks and I got good deals on clothes, now u have to shop in 10 different places to try and get a deal to save money, can't somebody open up a one stop for deals, the only place I can find is the dollar store, I think the word Deals is located at the back of the Dictionary now, its now about how can we shrink things and charge the same price, like potato chips they blow up the bag so u think you got your moneys worth, you can't fool an old wise fool. If I had the money to invest I would open a store called Deals are Here, I am tired of shopping in 10 different stores, I have 9 grandchildren and like to have snacks for them and they can eat!!!! One Fact is Nissen's Annex needs to come Back! Trips to spags during the summer before school started were the best. In the late 70's and early 80's, we would drive from ct to go. You could find everything there! Makeup, toiletries, freshly ground peanut butter, back to school supplies- you name it! In my later years- teacher' a resources. I will always remember spags fondly- especially every time I use one of my resources with the spags bright orange price sticker on the cover! Great memories! Loved SPAG's. wish I could go back in time to see it again with the family back in the 70's and 80's. 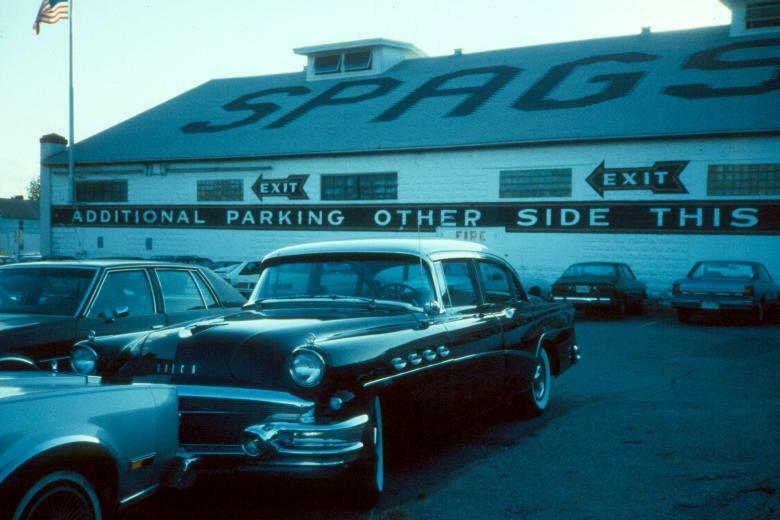 Spags was a nightmare for parking and even getting around in the store,but I loved it. Went there as a kid with my parents, then went myself as I got older, until it closed. Used to love their cans of pistachio nuts, they were like 2 bucks a can!! It was a wonderful store with great prices, you just have to endure the crowds!! Once a month, my dad would take us kids to Spags to load up on electrical/plumbing supplies. He owned upwards of one hundred apartments throughout the 50's and into the 70's and did his own maintenance. My brother and I would head to toy section as my dad loaded up boxes of needed supplies. We had the run of the store, but my dad knew where to find us. After the shopping was done, it was next door to the Tasty Freeze for an ice-cream before the ride home.....What a great treat and memory. One other great memory was with Spag himself. I was purchasing some plums when I heard a voice behind me say, " hay young fella, I was going to by that one!" I turned to see Spag pointing to my hand that had a plum in it. I said no problem, its yours. I bought the plums and went back to the area where Spag was standing and gave him that plum. The smile and hand shake was worth a million dollars to me. What a wonderful man and a Worcester gem that will never be matched. God Bless you Spag, you made many memories for a lot of people. I also forgot-every time I was in a restaurant I didn't like after I found out Spag's wasn't a restaurant, I would say the restaurant I wanted to be at was Spag's, and my mom would say "You want to go all the way to Shrewsbury to go someplace that isn't even a restaurant?" Another time when I said the above my mom replied with "What are you going to eat there-a coat?"